Thursday’s Already Giving Me Agita And It’s Only Monday! A few days out a small shift in trajectory spells the difference between hit and miss. You hope for the models to come into agreement… and then you just pray. It’s December. We’re in New England. It snows. I understand. I’m still not happy about the forecast for Thursday! 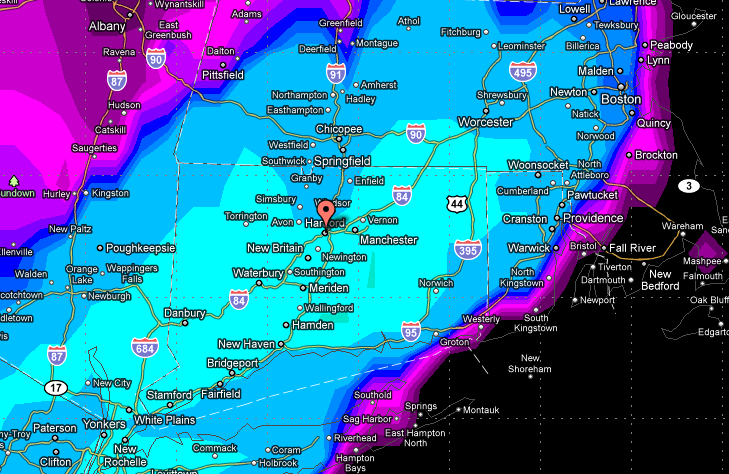 When I looked at the 18Z GFS yesterday afternoon the probability for snow Thursday was fairly obvious. A low pressure system will be south of us moving east. Moisture from the low will be pressing up against cold air. The 00Z run came in just before I went on-the-air at 11:00 PM. The snow was gone! Of course that’s the problem. A few days out a small shift in trajectory spells the difference between hit and miss. You hope for the models to come into agreement… and then you just pray. Typically this kind of scenario produces a light-to-moderate snow in less than twelve hours. It would be enough to close schools, but most people will be tempted to go to work. I’m planning on rigging some cameras in my Subaru Legacy just in case Premier wants to do a “proof-of-performance” ad sometime. Rachel and I discussed snow before she went on today. I told her I was glad not to be on the forecast at four. She said the same for tonight at 10 and 11. There will be a lot of number crunching going on over the next few days. Pieces of the forecast will surely change. If you absolutely, positively need something done by Thursday as of now you should probably plan to do it Wednesday! Did that EWMWF snow forecast graphic come from a public website? If so, can you send pass along the link? Oops…I meant to type ECMWF. I’m sure you know what I meant. Ahh, poo. Not ready for snow just yet. It’s been far too nice and mild! I was hoping for sixty degree weather. Ok. I’m going shopping Wednesday. I get the hint! Geoff….it’s so nice to have you back where you belong, forecasting Connecticut’s crazy weather! Rachel is awesome, and I enjoy watching you work together. You are the team to watch!! Hey,GEOFF! We all know snow is inevitable,just not ready for it, myself. I’m a big guy,stuck using public transportation,and, at 55, really afraid of breaking a bone, or, two. Many homeowners STILL, don’t shovel their sidewalks, in a “TIMELY” manner. AND, those who do, don’t realize,that even a light coating of snow, melts in the sun, but, re-freeze’s, at night. This makes it dangerous for everyone. Thursday Mom will turn 85. Snow on her birthday’s no big surprise to her, but we’re paranoid now about power outtages and hope we get through unscathed. She was lucky to have one son, in New Britain, to go to with power staying on during the last fiasco.